Families & Fans can get one too! What a great season for Real! Our teams did fantastic. All Real teams' combined games this Spring season yielded a 60% average winning record, 70% if accounting for the tied matches! This is a great achievement for our club, specially considering the fun style of play! Formidable season for the Real Middleton CF U10 boys beating three Boise Nationals SC teams, two FC Nova teams and two Idaho Rush teams in the top division of the Idaho D3 League and finishing with a 7-0-1 record. See article here. 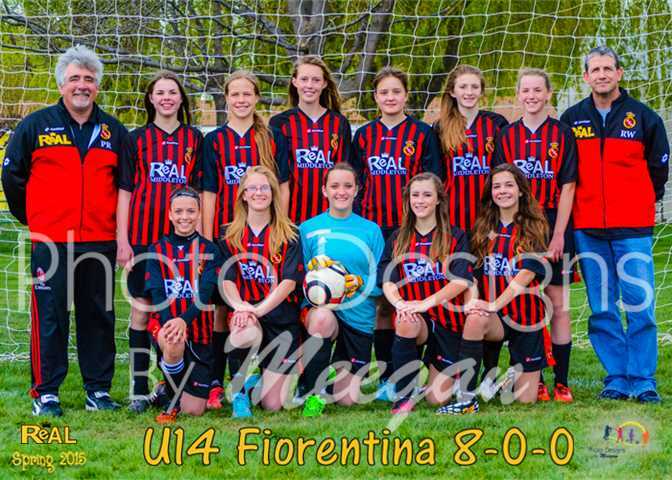 Our Real Middleton CF U14G Fiorentina ends up with a perfect record 8-0-0 and league champions! This makes very proud all our club! See team picture here! Historical performance of our Real CF U14 Heat girls team in the USYSA State Cup ending among the top 4 in the State and being the only Idaho team earning to represent the State in the USYSA Presidents Cup Regional Championship (Region IV) in Snohomish, Washington, June 10-14! See team picture here. Our Real Middleton U12 girls and our U13 girls teams had a phenomenal campaign as well with 5-1-2 and 4-2-2 records respectively and the rest of the teams ended up with a respectable 50-50 season. Team Articles are expected to appear during the Summer in various gazettes and publications! We all are very excited about the 2015-16 soccer year ! Rain will not be a cause to stop tryouts unless it is really severe. WHEN LIGHTNING SEEN - 30 minutes inside cars and see if it clears. If lighting is seen again, 30' more in cars. OTHERS - The club will make a call on the spot. - Read here about our Academy Philosophy, our Coaches Education Benefits, Practices and more. - Our fees are the lowest around and still our youth academy is directed by a professional director. We build technical sound players and emphasize the development of coordination, awareness, insight, and creativity! See our beautiful professional Youth Academy Soccer Uniforms here made by Italian Pro-Soccer brand, Lotto!